Apple's vice president of Environment, Policy, and Social Initiatives Lisa Jackson today announced that Apple has joined global renewable energy initiative RE100, a campaign that's dedicated to getting the world's most influential companies committed to 100 percent renewable power. Jackson shared the news at Climate Week in New York City, where she also shared some details on Apple's recent environmental progress. In 2015, 93 percent of Apple's worldwide operations were powered with renewable energy, and in the U.S., China, and 21 other countries, Apple uses renewable energy for 100 percent of its operations. 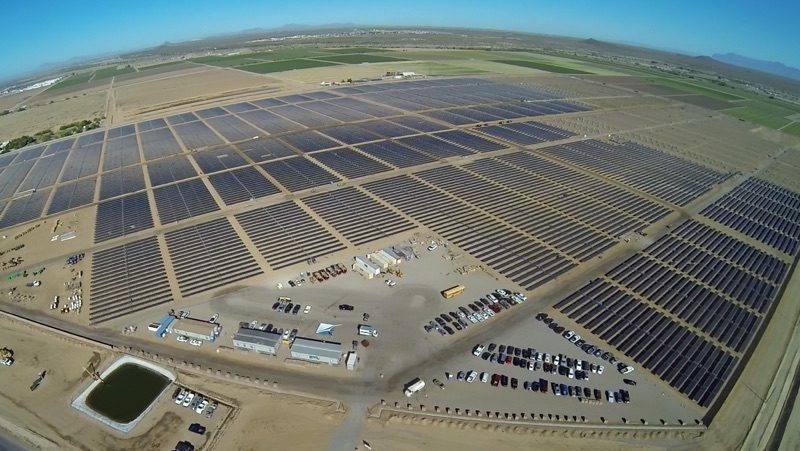 According to Jackson, Apple just completed work on its 50-megawatt solar farm in Arizona, which will power Apple's global data command center in Mesa, Arizona, the former location of Apple sapphire partner GT Advanced. Jackson also gave an update on Apple's commitment to helping its suppliers use renewable energy, announcing that Apple supplier Solvay Specialty Polymers, which makes the antenna bands used in the iPhone, has pledged to use 100 percent renewable energy for all Apple production. Catcher Technology, a supplier that provides aluminum enclosures for iOS and Mac devices, is also aiming to reach 100 percent renewable energy by the end of 2018. "Apple is committed to running on 100 percent renewable energy, and we're happy to stand beside other companies that are working toward the same effort," said Jackson. "We're excited to share the industry-leading work we've been doing to drive renewable energy into the manufacturing supply chain, and look forward to partnering with RE100 to advocate for clean-energy policies around the world." Other major companies who are members of RE100 include IKEA, Adobe, BMW, Coca Cola, GM, Google, HP, Microsoft, Nike, Philips, Starbucks, and Walmart. When it comes to the environment: "We're a green company with a conscience, and if you don't like it, get out of the stock." When it comes to taxes: "We have a fiduciary responsibility to our shareholders to use every tax avoidance (which is legal) loophole possible." The quicker and more widespread the move to renewable energy the better. This is an area Apple can genuinely help change the world for the better. And I think it's both ethically and economically the right direction to go in, those things do not have to be mutually exclusive. When it comes to taxes: "We have a fiduciary responsibility to our shareholders to use every tax evasion loophole possible." That photo explains why it's called Green Energy ... because it uses up so much land. From a financial standpoint this is a positive both short and long term. Short term has the Benefits of PR. Long term is the investment in infrastructure that leads to vastly reduced overhead in the years to come. Now, how can we turn this into something negative, like why Arizona and not Alabama or so? Why no picture of Lisa Jackson, so we can rank on her? Seriously, this should be a worldwide effort and joined by ANY manufacturer or any company giving orders to contract factories. PS: I am having a hard time believing "China". If I read it right it's 100% of "its" = Apple's operations" , not the plants they use. What exactly does it mean to be on 100% renewal energy when it's pretty clearly implied that excludes your suppliers? Whose definition of "100%" are we using exactly? Apple's suppliers are a pretty big piece of their business. I think you will find they mean their shops, offices and other apple run premises. They are helping and encouraging suppliers to move to green power, such as the vast solar farms in china they have helped fund. I wonder if at Apple Campus 2 they have installed EV charging points in the parking for employees. I am happy to see Apple continuing to bring attention to responsible energy consumption. They don't HAVE to, as many other high-profile companies have not even begun to be environmentally responsible.